Do you want to reduce churn, increase retention, and attract more customers who receive greater value from your products and solutions, leading them to purchase more and advocate for you, expanding your business and increasing your enterprise value? We have a range of custom solutions that will identify your strengths, challenges, with recommendations on how to capitalize on your opportunities in achieving your optimal customer success. Complete our assessment questionnaire and receive a full 30-page report on areas you are doing well, as well as where you are challenged with your Customer Success capabilities. 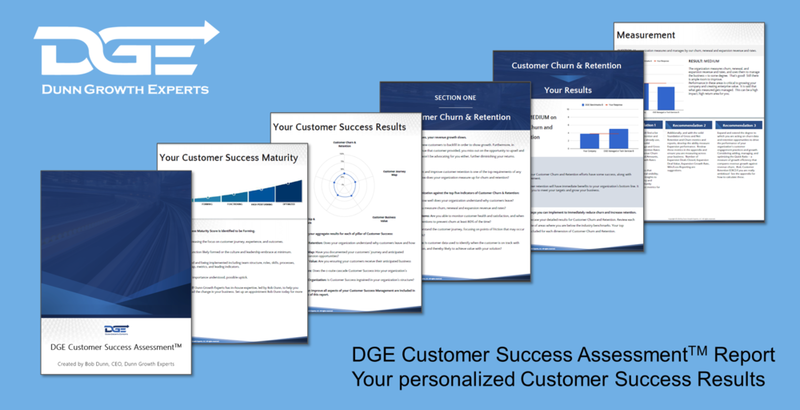 This report includes the DGE Customer Success Maturity Model ™ and DGE Customer Success Benchmarks™. Here are a few of the items you'll receive with the report, along with many more!